On Wednesday I am heading to Moab for what is going to be an amazing adventure with Chasing Epic and Alexander of Singletrack Sampler. I am totally stoked as this is going to be completely different than the riding I have been doing in North Carolina, South Carolina, and Tennessee. The only slickrock we have is a small loop in DuPont and I am guessing Moab will be a dusty mess instead of the wet rock we have had this winter/spring so learning that surface will be entertaining I am sure. I have been gearing up for this trip since I decided to do it in December. I knew my fitness was not going to be good enough for 4 days of 15-30 miles and 1500+ of elevation a day and didn't want to be that guy that holds the group back. So I put myself through the wringer and rode Pisgah and DuPont almost exclusively for a few months to gain the fitness quickly. I made sure to climb, climb, climb to make sure I can hang. Now I am comfortably at the point that I can ride 1500-3000' feet of elevation over 15-20 miles multiple times a week and hit a downhill park on the weekend and still have some in the tank. Our itineary looks amazing. We will be hitting all the epic rides in Moab. This will also be the first time on a trail bike that is not my Motobecane Team Fantom 6x6. I will be riding a Spot Rollick. It will be interesting to ride a different bike for sure as I have only ridden my trail bike and my newly acquired Transition TR500 DH bike. I believe the Spot will have an Eagle on it so it will be nice to have such a large gear ratio compared to my 34/42 combo that gets me in trouble sometimes due to the lack of ratio but it is great for getting in shape! Look back later this week for some more posts and some unedited video of the epicness of Moab! This week I was able to get up to Pisgah twice and put in some hard miles on some difficult trails. The first ride I didn't take video as it was so cold I wasn't sure what would happen to my gimbal and cold weather gloves and trying to hit record on the go pro would have been futal at best. The first ride was Sunday, me, and a few friends (new and old) decided to hit up Pisgah even though it was 11 degrees at 10 am! Top of Black Mountain Trail. We started at the Horse Stables and climbed Clawhammer up to Black Mountain which had some beautiful frozen waterfalls I wanted to take some pictures but, didn't want to stop because it was so cold. Can't sit still when its this cold for any amount of time when wet, so we proceeded to do upper Black Mountain and down the other side after a very brief break. This trail is no joke on the way down. Short but gnarly. Avery Creek is a fun trail with some technical aspects for sure. Technical rock gardens on ledges everywhere, drops into other rock gardens, switchbacks with drops in them and you can gain a ton of speed in a hurry if you want to. There is one switchback in particular that you can take the high side of the turn and drop down.... that was no issue. Coming down a couple of hundred feet from there were some drops, and there are two lines you can take. Around them or through them. I opted to go down the middle of these because I was overconfident and the bottom of my front tire dropped into a hole under the leaves and OTB I went and slammed back first into a tree. Always fun. I got up quickly though as my pack took most of the brunt, my elbow hit a rock pretty hard but can't dwell on the little things so back on the bike and down to catch the guys. There were a few treacherous stream crossings because of the ice. One, in particular, Patrick slipped on and damn near went off the ledge. He was laying on the ice holding his bike that was hanging over the side! It was risky being out there for sure. After that, it was pretty smooth sailing to Avery Creek Road. Avery Creek was only the first leg of this ride, so I had some more learning and climbing to do. We took a short break at Avery Creek Road and ate some food before heading up. I bought a delicious chocolate chip cookie from Sycamore Cycles on the way into Pisgah and that hit the spot! One guy dropped as it was still freezing and sometimes opting for a beer and a fireplace is the right decision! The three of us that were left headed up to Bennet Gap. Bennet Gap is another gnarly trail that is classic Pisgah. Huge drops, extremely technical climbs and obstacles that I won't even attempt at this point as I will probably end up on a stretcher but it is super fun. I had done Bennet once before on Black Friday and had no issues. I walked a couple of things that I rode this time around but I didn't crash at all, but this time it would be different. Once we finally got to the actual downhill, there are some fun obstacles such as trees laying on the trail that can be jumped. One, in particular, can be dangerous if you take the wrong line and land on a branch of the tree or you don't have your hands at the end of your handlebars as sometimes they will drift inside and you don't gauge the width correctly, and you clip a tree, which is exactly what I did. Clipped the tree, went OTB for a second time on this ride. My confidence was shot. We hit the gnarly drops after that section and was down to lower Bennet, but I didn't try anything new and took it easy. 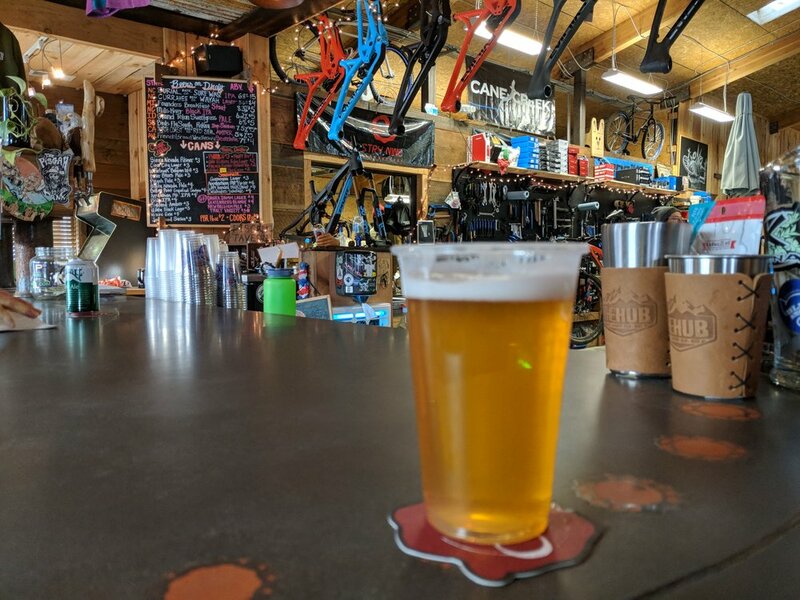 Lower Bennet was easy enough and back to the stables to grab the cars and head for post-ride beers at the Hub! Lessons learned: Overconfidence is dangerous and when riding to make sure my hands are at the edges of the handlebars. Also the cold isn't as terrible as I thought it was going to be. Burial Brewing Company - Surfwax IPA. First Burial beer I have had and was impressed!